The Ecotex Jewelry Bag is made from 3 recycled water bottles. By utilizing discarded materials to create new products, Heys offers an Eco-friendly choice for a clean and sustainable future. What is Ecotex ? 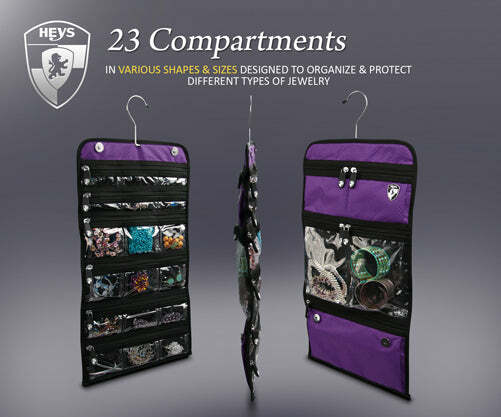 Organize and protect your valuable jewelry with the Heys Jewelry Bag.The Heys Jewelry Bag features a total of 23 dedicated compartments designed to accommodate various types of jewelry and accessories, from small earrings to large watches. Using a combination of transparent and nylon pockets, it has never been easier to organize and find what you are looking for. It has soft fleece interior lining to help protect your valuables from scratches. The swiveling hook provides easy flip over access while hanging. 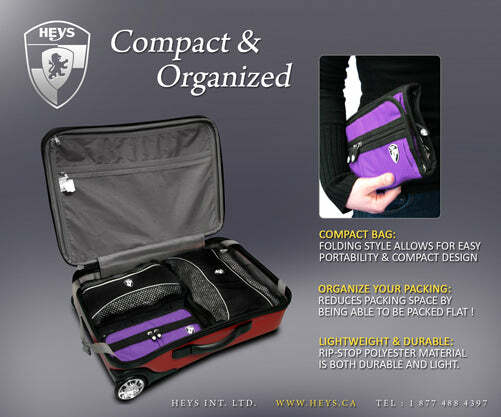 It can be folded into a compact form that allows for portability and reduces packing space. Made from rip stop polyester, it is lightweight, durable and water resistant. The Heys Jewelry bag is a quality product that will withstand the test of time alongside your jewelry.